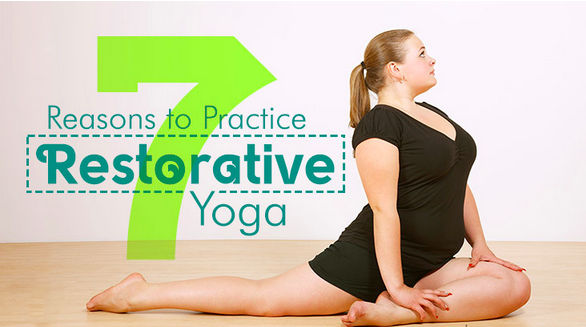 Here are seven reasons why people of all ages and all abilities should practice Restorative yoga. Restorative yoga generally calls for holding postures for at least two minutes and often even longer. With this extended hold, tight muscles stretch and release slowly, allowing you to get deeper into the pose. The longer you hold it, the deeper you can get. Thanks to props, Restorative yoga reduces the risk of straining muscles by rushing into the pose. 2. It releases tense muscles. Restorative yoga allows you to release the tension and negative energy often stored in muscles. With the use of props, muscles can relax as they stretch. As the muscles loosen, you may feel an incredible release of tension as tightly bound muscles relax and energy flows freely. 3. It calms a restless mind. Consider Restorative yoga a form of meditation done in different positions. As you hold the poses longer and allow the muscles to relax, you can create a space to calm the mind, focusing solely on the breath—or, ideally, focusing on nothing at all. The more you practice this, the more you can carry it with you off the mat. 4. It heals the body. Restorative yoga activates the Parasympathetic Nervous System (PNS). This is the involuntary part of the nervous system that controls the heart rate, intestinal activity and other bodily functions that hopefully you don’t think about. When the PNS is engaged through Restorative yoga, the heart rate slows to a healthy level and the organs of the body are able to regulate themselves better than our typical frenzied state of being. 5. It induces emotional healing. As the mind calms and a place of acceptance opens up, it’s not uncommon for negative emotions that have long been buried to rise to the surface and an emotion release to happen. In other words, it’s not at all uncommon to break out into unexpected tears in the middle of a Restorative yoga practice. It may surprise you when it happens, but just accept it, let it happen, and you will feel a sense of relief like nothing else. By calming the mind and body, Restorative yoga also rejuvenates the body and boosts the immune system. Because the postures are not overly taxing on the body, this style of practice is also beneficial for people who are ill or weak. 7. It allows you to reap the full benefits of each pose. Often in a Vinyasa yoga class, we’re quickly moving from one pose to the next, and while we get the benefits in that time, we can always use a little more. Restorative yoga allows that to happen. For example, a Forward Fold is calming when you hold it for five breaths, so imagine what can happen when you hold it for five minutes. Like the organ-activating benefits of a Twist, try holding it for more than just 30 seconds. Your body will thank you. Consider Restorative yoga a treat. It’s a time for you to just let everything go and give your body the love and nurturing it deserves. It works hard for you every single day, reward it with a Restorative yoga class!